My friend “Chopper Dave” and I have been doing some IFR flight training together and have been trading-off being safety pilots for each other. The other day Dave was asking me what I like to use for my electronic flight bag, recommendations for an IFR study course, and what I use for my flight simulator. This is a description of what works well for me. There are a ton of options out there and other pilots may have other suggestions for what works best for them. I like to use the iPad mini 4 in the cockpit. I used to use a full-sized iPad but it just seemed too large for the smaller airplanes that I fly. The current iPad mini only comes in the 128mb version now and that is the one I have and I really like it. It also looks like they may have come down in price a bit since I purchased mine. If you get one for aviation I would suggest purchasing the one with cellular service. Even if you don't take advantage of the cellular service feature, the cellular version includes an internal GPS receiver and I have found the internal GPS actually works pretty well...even when I forget to turn on my Stratux :) The Wi-Fi only version doesn't have built-in GPS. My wireless carrier only charges an extra $10 per month to extend cellular service to the iPad & that way I can open and close flight plans during flight, receive weather updates, etc...as long as I am in cell range. 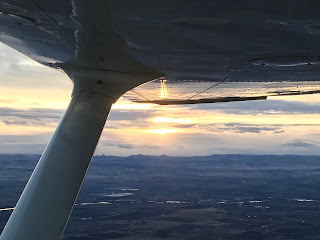 One thing worth mentioning is that when flying into the Idaho backcountry the majority of the backcountry doesn’t have cell service so don’t expect to be able to close your flight plan using your iPad after you land at a backcountry airstrip. I currently have the iPad paired with a Stratux that I built from a kit which works great for receiving ADS-B and displaying surrounding traffic on my iPad. I also purchased the apple iPad cover which was about $40 and so far it has been totally worth it. One drawback to the stock cover is that it is not the toughest cover out there. I like the simple design of it, but if you are looking for something that might take a bit more abuse then there are a lot of other options out there for iPad covers made by other manufacturers. I usually take the cover off when flying but leave it on all other times to protect the glass. The stock cover is also compatible with my knee pad iPad Holder if I want to leave it on while flying. The stock cover also works as a table stand when I am reading study material on the iPad. There are a lot of options for electronic flight bag software and I like using ForeFlight on the iPad. ForeFlight seems very intuitive to me and I like the fact that it works on both my iPhone and iPad and I also like using the desktop version for flight planning and checking weather, etc. The desktop and devise versions are all linked to your account so when you update information on one device it will update your other devices. With ForeFlight you can download all of the FAA published material including VFR Sectionals, IFR Low Charts, Approach and Departure Charts, etc. One feature I really like is that the charts are both seamless and interactive. That is, if you are flying from one area a sectional might cover to another sectional there is no switching of maps required. ForefFlight shows it all as one seamless chart and it shows the location of your airplane on the charts. Included in the “Documents” tab you can also download FAA published books for free such as the FAA Airplane Flying Handbook, Instrument Flying Handbook, Instrument Procedures Handbook, Aviation Instructors Handbook, and of course the Airman’s Information Manual (AIM). Just having that feature saves a ton of money in not having to purchase books. Another advantage is that the information is always up to date which is a really nice feature. You can customize your Foreflight subscription to suit your own needs too. Foreflight has a little hidden link at the bottom of the pricing page allowing you to "build your own plan" instead of choosing the pre-packaged plans. Just click on the "Build your own Plan" option at the bottom of the page. I used to have a customized plan but recently I upgrade to the "Pro Plus" plan for the interactive IFR Charts & additional features. That way I can see where our flight is located on the actual IFR chart & where my airplane is located on the Airport Diagram for taxi and ground operations. ForeFlight will provide an audible and visual warning when approaching a runway which I think is a great situational safety feature along with the interactive airport diagram. I can see this as being super useful at an unfamiliar airport. There is other software out there like WingX and FlyQ but I haven't used those and they might do the same thing as Foreflight. I have been super happy with Foreflight though and it works well for me. For my IFR written study material I am using the Sporty's Instrument course and it works really well on the iPad. Sporty’s has an app for the iPad and iPhone that allows great interactivity with all of your purchased courses from Sporty’s and they are continually being updated with new information and features. This course is great both for pilots aspiring to get their instrument rating and those that are instrument rated but would like an IFR refresher. With the Sporty’s course I can study reading material, watch training videos and take practice tests using the iPad app which is super convenient. The Sporty's course has been great for me but there are also other options out there. Some other great options are King Schools, Gleim, Rod Machado and Pilot Workshops. I did the King Schools training program for my Private Pilot’s license back in the early '90's and then I did the Sporty's Private Pilot Course as a refresher and I liked the Sporty's course a lot so that is mainly why I chose the Sporty's Instrument course and I am really enjoying it. When I am flying I use a MyGoFlight (MGF) Knee board mount for my iPad and it works great! The MyGoFlight products seem to be built really well and are well designed. The Knee Board Mount is also compatible with suction cup mounts such as the MGF Flex Suction PRO. I have a similar single suction mount and it really doesn't seem to work that well though. It seems like I have to use the pump quite often to keep it attached. When the red line becomes visible you know it is time to add a few more pumps to the device to keep it attached. If I were to experiment with other suction cup mounts I might go with the MGF Flex Double Suction but I’m not sure if I would spend the money because the MGF knee board actually seems to be working great! Here is a link to the MGF Flex Double Suction Mount. If someone else has used this product please let me know how well it has worked for you. One of my friends that I fly with uses a yoke mount for his iPad & MGF makes one that I have thought about getting but I don't really like the idea of my iPad moving around with the yoke while I am flying. For flight simulator software I have been using X-Plane which I really like because it has a Garmin 430 and it links to my iPad and ForeFlight so it looks very similar to the cockpit and instrument panel in the planes that I fly in reality. A really cool feature of X-Plane is that it links to ForeFlight you can see exactly what the flight would look like on your iPad and save flight tracks just like a real flight when your flight is completed. The biggest challenge with X-Plane that I have found is modifying the rendering settings to make it work with your monitor setup. I have three monitors so I put the 430 on my right-hand screen and I have my rendering settings set up so that the cockpit looks similar to being in many of the same airplanes that I fly in real-life. It doesn't have the Garmin G5's which is one difference to the planes I have been flying but maybe X-Plane will add those features in newer versions as the G5’s become more popular and are included in more panel installations. Along with X-Plane I use a Saitek Pro Flight Yoke with a Throttle, Prop, & Mixture Quadrant which makes it a much more realistic feeling of interaction. I use CH Pro Pedals that I found for a good deal on e-bay & those hook directly to the Saitek yoke system. If you are looking at the CH Pro Pedals make sure you get the ones with the USB compatible connector. I think there were some older versions of these rudder pedals that had a different plug connector that may not be compatible with the Saitek or other yoke systems. Flying the flight simulator doesn’t count towards any actual flight time or instrument time but that doesn't really matter to me. I would much rather be outside flying real airplanes but the simulator is a great way to keep your skills sharp when the weather is too bad to fly or when I use up my monthly flying budget before the end of the month. I have been using the simulator to help practice approaches and familiarize myself with approaches to an airport I am planning to fly into. That way I have a better understanding of the airport’s procedures before I get there in real-life. The simulator has also been really helpful with my Instrument training for practicing holds & pattern A and pattern B exercises. Hopefully this helps answer some questions on devices, aviation software, training and simulator options. Remember that these are just tools to aid in situational awareness and flight training. They aren’t a replacement for actual flying skills and proficiency. The only way to really master good flying skills is to get out there and FLY! Have Fun & Be Safe! Near the Eastern Border of Oregon is a small rural town with a lot of character. Vale, Oregon has a population of about 1,800 and a few of those folks must be really good Artists! Many of the buildings in downtown Vale have beautifully painted murals on the sides of the historic buildings celebrating the grit and determination of the Pioneers that braved the Oregon Trail when settling the West. Vale is only 39 miles as the crow flies from where our airplanes are based in Nampa, Idaho. 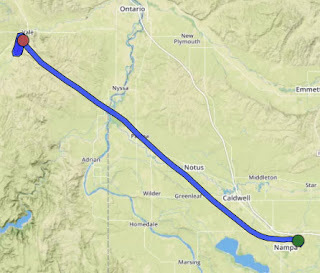 Vale, Oregon is only 39 miles from Nampa, Idaho. I was surprised to find that Vale also has a really nice runway facility. The main runway in Vale is a nice paved runway. The “U.S. Chart Supplement”…Formerly the “Airport /Facility Directory” (A/FD) shows the runway as 3,872’ long by 65’ wide. The name of the facility is Miller Memorial Airpark. I decided to fly over and check it out since I had never flown into Vale before. I grabbed a bag with my running shoes and some running clothes and headed out for an adventure. From looking at some maps it looked like the downtown area was easily within running distance and I was feeling like I needed some exercise anyway. The main runway at Vale is 36/18. There is also a dirt runway that crosses 36/18 but I walked that runway and it was pretty soft and muddy this time of year in January. 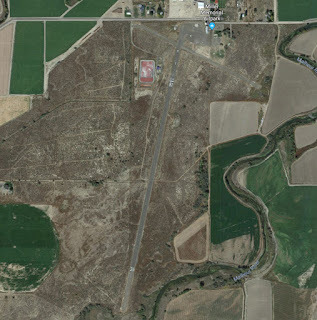 Aerial View of the Runway Environment - Notice the Malheur River just to the East of the Runway. Once arriving in the Airspace around Vale I noticed a lot of birds in the area so I had a real watchful eye out for avoiding any close encounters with our feathery friends. It also looks like there could be deer or other animals grazing in the area surrounding the airstrip so I decided to do a couple low passes to make sure no animals were going to dart out in front of me on landing. Once on the ground I decided to taxi over and park next to some other airplanes on the ramp and that turned out to be a really bad idea. As I got closer to the other airplanes I noticed that maybe they hadn't been flown in a while...maybe in a LONG while. Not only that, but they were parked in mud. The gravel surface actually looked pretty good even though it was wet, but it was very deceiving. The gravel was like the hard coating on a good Creme Brulee. It was hard on top but there was a soft gooey mud under the gravel. As I slowed down I could feel my tires slowly sinking into the mud. It took me about a half an hour of pushing on the wing struts and rocking the plane back and forth to get the airplane back onto somewhat solid ground. After that I was able to taxi over to this small island of concrete that was safe from the Creme Brulee Mud of Despair. An Island of Dry Ground! After getting the plane safely to the concrete island I explored the airport a bit. It looked like someone else had the same fate and then had devised a system of staying above the muddy mess below the gravel surface using expanded metal catwalk material to support the tires of their airplane. The other airplanes were not so fortunate. I have no idea what this airplane is. It looks like a hombuilt. It has Flaperons like a Kitfox which is pretty cool but it has very odd proportions. It does say it has a Lycoming Engine. If anyone knows what this plane is, please add to the comments below. I looked it up on the FAA registry and it is listed as a Vulch-Air which I thought was a pretty clever name! This is a 1946 Luscomb. Seeing these abandoned airplanes always makes me wonder what the back story is behind them. It also makes me wonder if they will ever fly again. After exploring the airport it was time to put on my running shoes and head into town. On the way I saw some funny goats and sheep and horses. Being in rural areas like this always reminds me of being a kid. These Black & White Goats on Logs are so Funny! This horse looks just like my horse named "Banner" that I had when I was growing up. I ran across this little creek called "Bully Creek" that empties into the Malheur River. Vale has some beautiful Architecture as well as the artistic murals that adorn the towns buildings. I particularly liked that there are so many different styles of architecture styles for a small town. From the indigenous stone building vernacular homes and historic buildings to international style civic buildings such as the Malheur county courthouse. I even spotted a really cool mid-century modern home on my run into town. Stone House built with Indigenous Stone collected from the surrounding area. This building in downtown Vale, Oregon reminds me of buildings in Chicago that were designed by Burnham & Root in the late 1800's and those of the "Chicago School of Architecture". Although not as extravagant it does remind me of the Auditorium Building in Chicago designed by Louis Sullivan and Dankmar Adler. I wonder who designed this building? This building reminds me of a very simple example of Romanesque Revival style. One thing that I noticed was that the lower arch above the door doesn't match the radius of the other two arches over the windows creating an interesting non-symmetry to the buildings facade. The stone detailing on this building is amazing! ...and here are some photographs of some of the beautiful murals in town. You really need to see them in real-life to appreciate the detail of many of these paintings. "As settlers move West, the United States built Army outposts to provide protection. When mining flourished, the federal government provided military escorts for precious ore shipments and payrolls. The Army built military roads through the area, often following existing trails established by wildlife, Native Americans and early emigrants. Many of our modern roads evolved from these military roads. "Our camp this night was on the Malheur Creek, a stream about two rods wide at the crossing. Here we found a rock bottom with springs of hot water boiling up in the bottom of the ford. At this place there is a large butte of red lava that looks like it had not got cool yet, and one would hardly suppose that it had, from the number of hot springs along its base. The grass is here good, but the water rather warm. "Still exciting after all these years!!" Hope you're getting settled in since being stations in North Africa. There you are patching up soldiers and I guess Warner is in Iceland building runways. Wanted to send you a postcard from Vale. On the fourth of July I went to town with Emil to the rodeo. Say, one cowboy darn ner got bucked to the moon! All is good here on the farm. Boy, believe me it's been really hot here. 105°. After visiting downtown I headed back to the airport. The airplane was still safely on the concrete pad so I started up the engine and headed back to Nampa. After a few touch and goes and making sure the traffic pattern was clear of other aircraft both visually and verbally on the CTAF I did a practice spiral 360 to landing with minimum power to simulate an emergency. I think it is always good to practice these types of maneuvers in a controlled environment so you are prepared if it happens in an emergency situation. It is also good practice so that you have an idea of how far you can glide and not over-glide or out-glide your landing area. It is a bit of a balancing act to manage the energy of the airplane so that you have just the right amount of energy to put the airplane down where you want to. I also thought it would be kinda fun to do a 360 degree spiral to landing since the runway heading is at 360 :)....A 360 to Runway 360! It was really relaxing to pull the power back and do a shallow gliding spiral down to the runway. Here is a video of the spiral approach and landing. The sun was getting low on the horizon and casting this beautiful light on the surrounding area too. Along the way home the sun began to set and it was another spectacular sunset from the air. I don't think I will ever get tired of seeing sunsets reflecting on the wings of an airplane!